For business, art should reflect your companies brand ideals and set a tone for how you want your customer to feel when doing business with you. Whether subtly or overtly, art can move your clients to a desired frame of mind and impact your staff in a positive way. Art sparks dialogue and enlivens the work experience. At the KPB Corporate headquarters huge art walls grace the entryway. Studio Art Direct designed this artistic installation, hired a photographer to shoot downtown Portland from an airplane 10,000 feet in the sky, photoshopped the image to feel modern and sleek, then printed it on 10’x30’ backlit panels that illuminate the Willamette River with efficient LED lights. 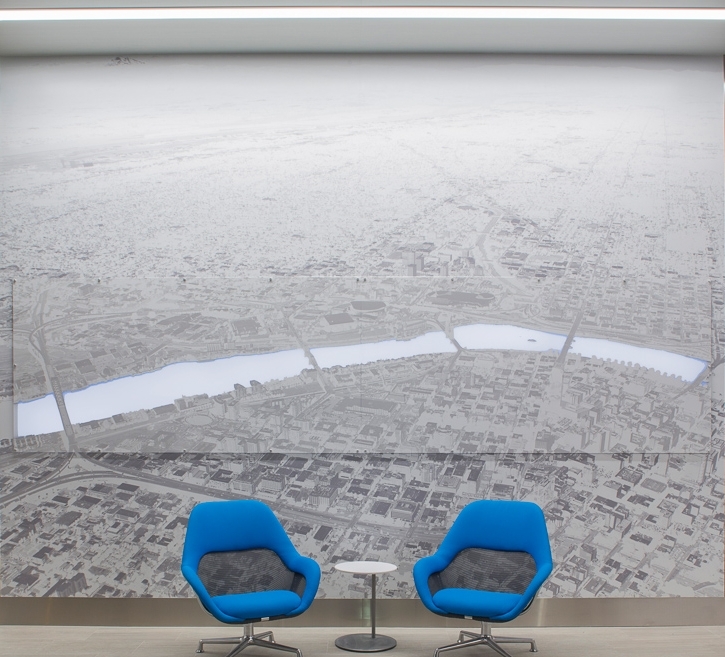 Coordination with GC and architect NBBJ was key to the success of this complex installation. Other work included custom art wallpaper in gym, a plex/photo history wall, large-scale commissioned watercolor wallpaper graphics, and historic imagery printed on wood panels.